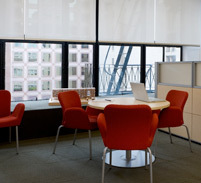 Sunlight invigorates the workplace, but can also decrease productivity with glare and over-heating spaces. Regulate daylight in commercial spaces with a shading solution designed to optimise comfort and lower energy costs. Systems can also be automated and integrated with other controls for additional savings and comfort. Most buildings today are over-lit because lights are on at full intensity while there is already ample daylight in the space. This wastes energy, creates discomfort, and reduces productivity. Couple a Lutron shading system with a sustainable fabric for a complete energy-saving story, and help earn points toward LEED . 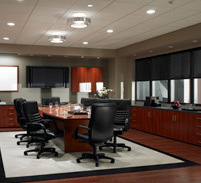 Preferred light levels and automated blind control are conducive to a productive work environment. 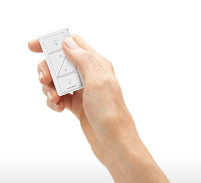 Automatically set lights and blinds to adjust throughout the day based on daylight available or provide employees with individual control so their needs can be met. Blinds block and reflect direct sunlight during the day to reduce the demand on air conditioning systems during the summer. Certain fabrics are dual-sided with a white or silver backing to deflect more sunlight. In colder months, lowered blinds can provide an insulating barrier to keep the building warmer. By automatically adjusting electric light levels in response to daylight, electric lighting needs can also be reduced. 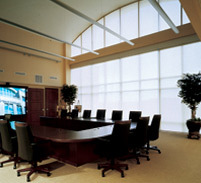 When selecting a Lutron shading system, you have the choice of technology, control, and fabric. With hundreds of fabrics to choose from in different opacity and colour, a conference room can have sheer fabrics for a meeting but blackout blinds for an A/V presentation. Bottom-up blinds can offer privacy on the first floor with a dim-out fabric while higher levels use a dual-sided fabric to create a uniform appearance from the outside while deflecting more daylight for increased energy savings. Small offices, conference rooms, and whole buildings have different needs and aren’t confined to sharing the same systems if working together. Having all blinds work together on one system doesn’t eliminate personalised control if the needs of a space change throughout the day.